Mummy Maze game. Free download Mummy Maze Deluxe. The Golden Mask of Tutankhamen awaits discovery, but only a daring and crafty adventurer can overcome the curse of his tomb! This new PC game is sure to delight fans of the exciting puzzler! It'll take all your skill and nerve to outwit the challenges of the Mummy Maze! Mummy Maze is a turn-based game. First you move, then the mummy moves, then it's back to you again. Your objective in each maze is to make it to the exit without getting caught by the mummy. The problem is that for every one square you move, the mummy moves two! You need to take advantage of his limited intelligence to trick him into dead ends and cul-de-sacs. Outwit the Mummy and find the treasure of the Pyramids! Stunning new 3d-rendered graphics and hand-drawn splash screens! Brand new Adventure Mode will challenge master adventurers! Defeat 15 of the most devious pyramids we could devise! Save your high scores and upload them to the web to compete with players around the world! Nearly 10,000 new mazes to try, including the all-new 10x10 puzzlers! 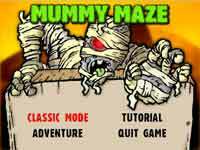 Please, download free version of Mummy Maze and install it on your PC before you can buy the full version of this game. This game is very challenging and witty it keeps you playing without getting at all bored. It wacks your brain. I want this game back on my comp I have recently played the short version and asked if I would like to buy it I don't know how to because it directs you but nothing happens no place to put in my credit card. Interesting, irresistable, mind boggling full of thrill & challenge.